Move oven rack to lowest position; heat oven to 425°F. Spray 15x10x1-inch pan or large cookie sheet with cooking spray. In medium bowl, stir Bisquick mix, very hot water and oil until dough forms; beat vigorously 20 strokes with spoon. Using hands dipped in Bisquick mix, pat or press dough in bottom and up sides of pan. Or pat dough into 13x10-inch rectangle on cookie sheet; pinch edges, forming 3/4-inch rim. 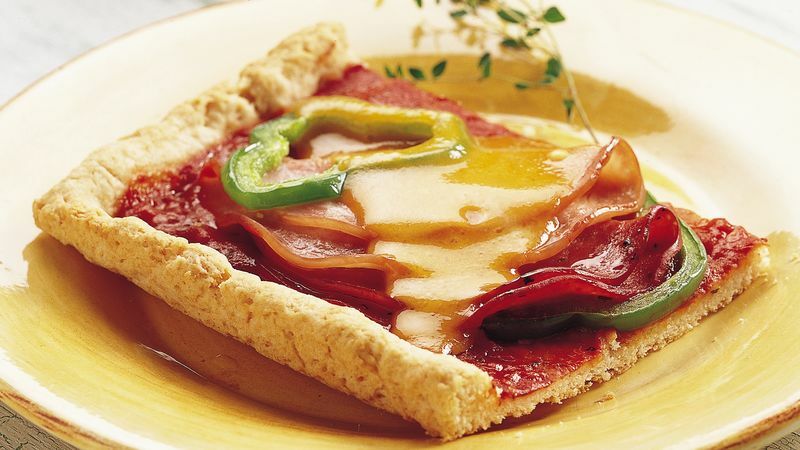 Spread pizza sauce over crust. Top with meats and bell pepper rings. Drizzle with dressing. Add cheese. Bake 15 to 20 minutes or until crust is brown and cheese is melted and bubbly. Reduce the fat and calories when you use Bisquick Heart Smart® mix, fat-free Italian dressing and reduced-fat Cheddar cheese. Have it your way! Any combination of ham, turkey, large slices of pepperoni, summer sausage, bologna or other cold cuts will work in this recipe.